Asphalt is one of the world’s most-used yet least-understood substances. It’s been used continuously for at least a couple thousand years. And in spite of improvements through modern technology, we still haven’t found anything that can replace asphalt paving for day-to-day applications. The asphalt used for road paving contains gravel, sand, oil-based liquid asphalt, along with some other constituents. Asphalt paving is flexible and durable, which are its most important qualities. Day after day, year after year, asphalt expands and contracts along with hot and cold weather, and it provides a smooth, safe, high-traction surface for vehicles’ tires and pedestrians’ shoes alike. Liquid asphalt is derived from the thickest residual portions of petroleum. Even after mixing with gravel and sand, asphalt in pavement may take up to a year to harden and cure. Here in Tucson, well-applied asphalt usually lasts about fifteen or twenty years. Some of the factors that determine the durability of asphalt pavement include how well it was designed and laid, how well it’s maintained, whether it’s been sealed regularly, how often water flows over and around it, and whether it experiences unexpected heavy use, such as truck traffic on light-duty paving. When a new asphalt pavement is laid, you can walk on it immediately. But, vehicles should stay off for 12 hours or more, so that it can harden properly. Of course, under Tucson’s bright sunlight recently-laid asphalt will soften during the day, then harden at night. On very hot days, you can help cool and harden fresh asphalt by spraying a bit of water on it. Don’t worry if soap suds result, since it’s a natural reaction to the high levels of chlorine in our local water supply. Whether your paving project involves asphalt pavement or a combination of asphalt and concrete, our expert teams ensure that it’s done right, so you’ll enjoy many years of good service. 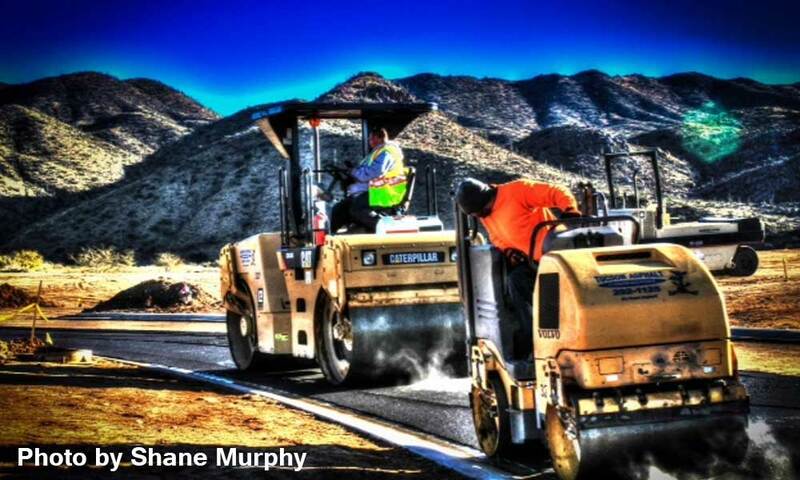 Tucson Asphalt is Pima County’s leader in paving and related construction. No matter how large or small your project, for a quick response and top quality results, just call us. Of course, while asphalt is fresh you’ll want to avoid parking heavy vehicles in the same place each time. And, be careful to avoid turning the steering wheel sharply while a vehicle is in a stationary position, because it may scar the surface. Still, although scuffing and power-steering marks are common on new asphalt, they usually fade quickly. Likewise, the kick-stands of motorcycles and bikes, the tongues of trailers, or any other hard-pointed item (even a woman’s high heels) may cause holes or gouges in fresh asphalt. Keeping a piece of plywood under parked tires or other pressure points can help avoid this issue. Fortunately, asphalt paving is self-healing because of its flexibility. Over time, and under the weight of vehicle traffic, scars and rough areas tend to heal themselves. And, larger tears can easily be touched up. As the hardening process continues, asphalt becomes less susceptible to damage. Once your asphalt paving has cured, it’s best to apply a sealant through a process known as “seal coating.” This helps prevent damage from spilled gasoline, anti-freeze, oil, and other vehicle fluids. After years of research, most experts have concluded that hot-mix asphalt (HMA) is more cost-effective than Portland cement concrete (PCC) when used for roadways. A landmark study, conducted by Drs. Stephen A. Cross and Robert L. Parsons of the University of Kansas, demonstrated that over a 25-year period the yearly expenditures for concrete pavements were 2.4 times more costly than for asphalt pavements. The same study also showed that the cost of concrete pavement over the long-term averaged about $2 million per four-lane mile, while the cost of asphalt pavement was only about $600,000 per four-lane mile.